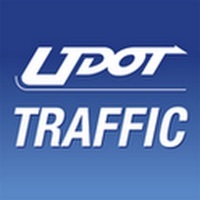 The UDOT Traffic app provides commuters and travelers with mobile access to information for Utah roadways from the Utah Department of Transportation's Intelligent Transportation System (ITS). The available information includes: 1) A zoomable, scrollable map-based display 2) Current traffic conditions on Utah's freeways and major surface streets 3) Lists of accidents, road construction activities, and other hazards 4) Special events that affect traffic (sports events, etc.) 5) Current road weather conditions and road weather forecasts 6) Seasonal road closure status 7) Closed-circuit television (CCTV) traffic camera images 8) Electronic roadway sign messages UDOT's Intelligent Transportation System (ITS) uses technology to save lives, time, and money. It is a computer-controlled system designed to monitor and manage traffic flow on freeways and major surface streets. System components include CCTV cameras, electronic roadway signs, traffic speed and volume sensors, pavement sensors, and weather sensors. It gives a lot of traffic information. What I want is up to date road conditions. Something I can see at a glance. Not have to page through and click through to find out if the roads are snow packed or icy etc. i have never seen anything close to that. The cameras are usually always down or blocked and I feel like they’re delayed by a few minutes because on camera it’ll look all clear but in reality it’s horrible. For the most part the app is good. They used to have the feature where you can see the snow plows out. I think they’ve changed it because I can’t see them ever. The app itself I a bit outdated but factual so overall 3/5. This app is great so far. I was trying to use the website on my iPhone until I discovered the app. It has everything the website has and is really well organized. It’s going to be so useful for many different situations. I download the app and from moment one it is not working. A Hugh snow storm comes in and everyone knows. When info is really needed the app crashes. AWESOME!!!!!! Every time I go to look on this it shows me stuff from days ago. It won’t stay current. I simply wanted to know if the roads were clear from Sandy to the airport after a snowy day. There may be a way to see this clearly on the app but you must be more techy than I to figure it out. 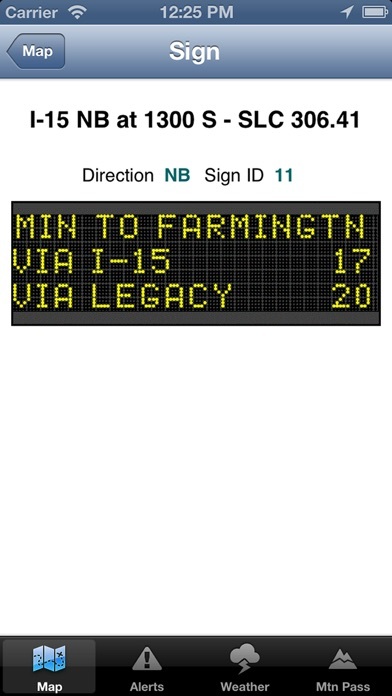 UDOT apps should be easier to use for the layperson. This is a pretty nice app. I like being able to click on the traffic cameras and actually SEE what the situation looks like. Would be nice if there were a “HELP” function. There are blue camera icons, as well as gray. The blue ones seem to be working, for the most part, and will provide a live (still) shot. The gray ones (currently) do nothing at all but return an error message saying that they’re currently not working. Tried a couple dozen of them. I love this app and use it all the time when traveling in the winter. 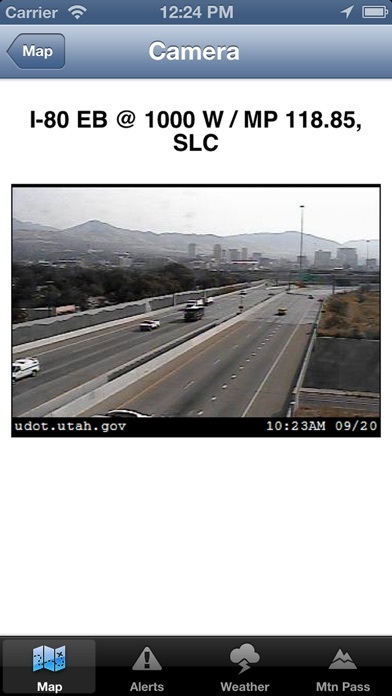 On occasion there is a camera that is out of service and the message says to use the UDOT Click & Fix app to report and request a fix. However, I don’t find that app. Camera SR-30 RWIS WB @ BE/CA County Line / MP 99.24, BE has been out of service for some time and it’d be helpful to get it fixed. It has marked 7200 S NB on I 15 permanently red. Been that way for weeks. Don't know why. It's so nice that I can use the cameras to see road conditions and traffic in real time! Has saved me from a traffic jam at least twice and makes it easier to decide whether to drive down Weber Canyon or not. Thanks, UDOT! I appreciate being able to easily obtain current road conditions. Logged on this morning and could see there is an accident and slowdown and could check out the cameras to see exactly how much snow there is between where I am and where I’m going! Please fix the line thickness for the iPhone 6+. The lines are super fat and overlap each other making the map unreadable. Or let the user change the thickness in settings. Easy to view and use! Gets the job done. It works great, I am able to see exactly what traffic is like and plan my driving accordingly. Traffic info and cameras fail to load during rush hour and busy travel times quite often. I got 12 of the same push notifications in 30 min. Deleted the app before I got any more. Like this app and find it pretty useful but today I am getting spammed with winter weather alerts every minute. Won't be turning alerts on until that's fixed! I love being able to check my trip route before I leave for any delays. The incidents section gives me a good idea about how accident prone the day is. The map lets me check where roads are congested and choose another route. The app rarely works, the cameras don't come up and if you are relying on this for travel in Utah and are using the Idaho app for cameras in Idaho, be careful in the wintertime they could get you stuck on bad roads in the middle of nowhere DONT RELY ON THESE FOR TRAVEL. The snow plow info is awesome. I love practical and useful apps like this one. I can see local cameras on nearly any major street in the Salt Lake valley. It isn't live video since that would be a data hog, but it updates still images from the camera every few minutes so you can get an idea about current traffic conditions in that area. Seeing UDOT snow plows on the map is cool too. Great for deciding when it is best to travel so you don't get stuck in traffic or in the snow. Thanks for going the extra mile to put out an app like this for the state! This will be used almost daily for me now before I leave the house! This is a must-have app. It loads fast and provides a very good snapshot of current traffic and weather conditions. 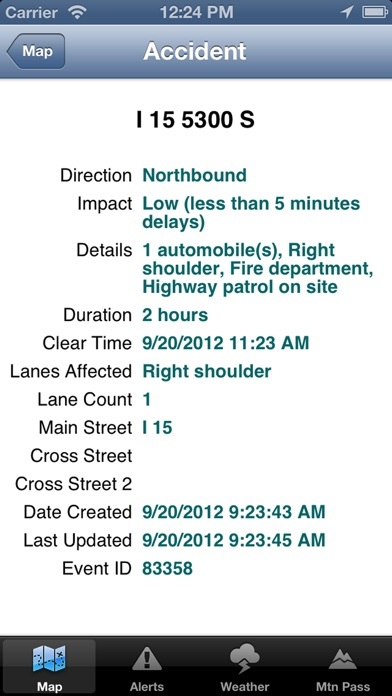 You can select to view traffic incidents, construction, and other options. The traffic cams are nice and pretty fast. Although they are helpful to me as it is hard to tell if the traffic is moving fast or slow, because the angles don't always provide a clear view of how far the vehicles are apart from one another. I probably just need more experience with them. I have not found the forecast option to be that helpful. It will probably improve over time. Works good. It is especially helpful to see the road condition when heading out if the weather is bad. But it can be slow loading. If they would make it faster loading I would give it 5 stars. I have used this app since the beginning. It has evolved into a nice multi information source with weather, cameras, road reports, and more. My only ongoing complaint is both the website and this app can't handle large volumes of traffic when we need it most, like major storms or incidents. Fix that please. The app is great to see how snow covered the road is that I'm traveling on. Curious as to why the travel advisories don't update more often. I missed out on work today waiting to see if a canyons driving conditions would improve. As I didn't want to get stuck or wreck. It hasn't updated in 8 hours, how is that helpful to anyone?? It needs to update more frequently. Example: It currently says that Provo is dry and overcast... Well, it's not. I'd say this is a blizzard, with quite a bit of accumulation. It's been like this for our whole trip since we left Wyo. UDOT could take some lessons from Wyoming's Wyo info (WYODOT) website, which was incredibly accurate and current. UDOT's app is so useful for current and future road conditions. UDOT consistently provides the most accurate information on accidents and weather conditions. 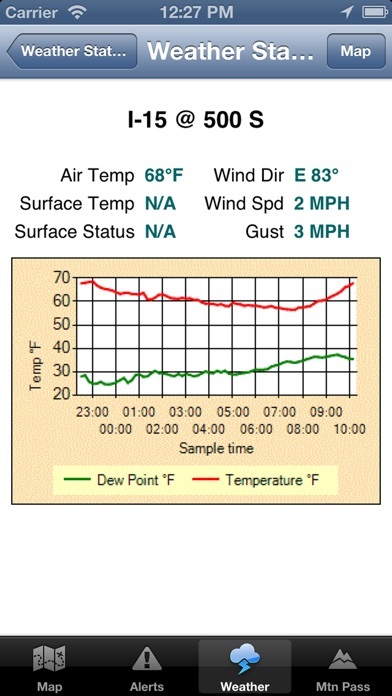 I used to try to figure out Spanish fork canyon weather through KSL or accuweather, but this is much simpler. I've also used it from my phone to help get around accidents. Up-to-date road and weather conditions, webcams along all major roads, travel alerts... every state should have an app like this one! This app has way more functionality than you'd expect, youcan check the camera of any location along the major highways for real time traffic reporting. Also has very precise weather reporting. Very surprised with how cool this app is. The screenshots need an update; this app looks like the rest of iOS 7. Need to be able to turn bicycle icons on & off while on that layer. Extremely cluttered & can't see actual roads (unless closely zoomed in). Love the new design. Functionality is awesome! Notifications would be a plus. Besides the traffic cameras always available, the road construction information is very detailed and up to date. Really a useful app!! I appreciate a real-time view of the roads. That picture is worth a thousand words. This is a great app! So much easier to navigate than the website. 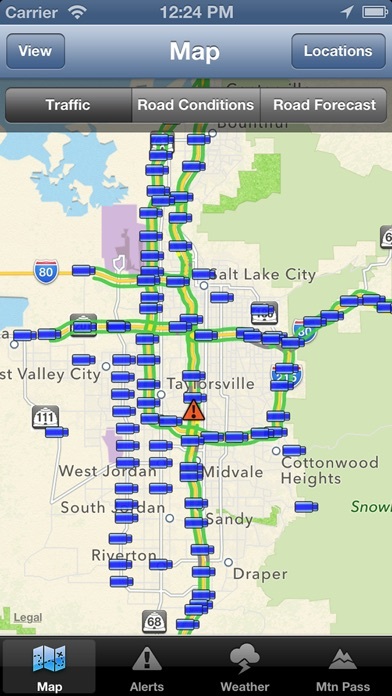 You can easily find traffic and weather status on all the major roads through Utah. You can even view road cams. The idea is great, but they are slow to update traffic information.